Drutex S.A. - Pressroom - Patio doors from Drutex receive the top prize in „100% Polish Product”. Patio doors from Drutex receive the top prize in „100% Polish Product”. DRUTEX has won the top prize in „100% Polish Product” contest organized by the ‘Do Rzeczy’ weekly that promotes the best Polish products. The jury awarded the original patio doors system Iglo-HS which is an expression of modern technological thought and innovative design. 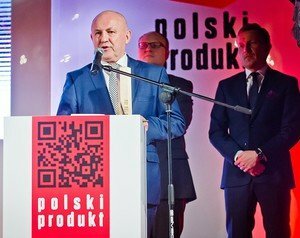 The „100% Polish Product” contest is dedicated to private companies, cooperatives and companies with Treasury shareholding based on Polish capital, that consistently build their market position focusing on local products and production. The awards are a recognition for companies and producers who are driven not only by the profit criterion but who also take into account macroeconomic environment and the social factor. The ‘Do Rzeczy’ plebiscite also aims at helping consumers who practice economic patriotism. The awarded Iglo-HS system is a modern solution created by Drutex from A to Z, from the concept, the project, through the prototype and the final product. The original patio doors were devised by Drutex own R&D department, technologists and engineers. The company has always relied on its own ideas and patents. Autonomy in production is the driving force of the company development and it determines its competitive advantage. Thanks to the strategy based on own research, testing facilities and own experts, the company has been able to devise products that set trends on the global woodwork market, to implement innovative solutions and respond flexibly to signals for the market, which gives the company the position of the undisputed leader in the Polish door and window woodwork. „I am happy that Drutex has won a prize in such a prestigious contest that awards the best Polish products. The award is particularly important since we have always pointed out that our products is 100% our own technology, own concept and ideas. We rely on our own R&D department and technologies. They are our experts. As a company we’ve never had any complexes about offering products with the ‘made in Poland’ label. We know their quality. Since we make windows from scratch to the final product, we are able to supervise thoroughly the production process and to control the properties of our products. It is a huge strength that allows us to set standards on global woodwork market. I am happy that Drutex has been appreciated as a company that represents Poland abroad and promotes the trend for Polish products. We definitely have not said the last word’’ - says the president of DRUTEX S.A., Leszek Gierszewski. The project was organized under the honorary auspices of the Ministry of Development, the ministry of Agriculture and rural Development, the Ministry of Science and Higher Education and by the National Center for Research and Development. The ‘’100% Polish Product’’ gala took place on 8 December in Stanislas Theater in the Royal Łazienki Park. The awards were given in the presence of the Deputy Prime Minister, the Minister of Science and Higher Education, Jarosław Gowin. Iglo Light window from Drutex receives the Top Builder 2017 award. Made Expo the International Trade Show for the Architecture and Construction Industry takes place between 13 and 16 March in Milan. Drutex has received the prestigious Acanthus Aureus award for the best stand at the Budma fair that takes place in Poznań between 12 and 15 February.